I try really hard, okay? I can recite Shakespeare’s “Macbeth” from memory. True story. “Dat Bearcat Tho: A Story of Mascotting, Diehard Fans and a Whole Lotta Fur”. That’s hard to say because Binghamton University triumphs in some regard every single day. Maybe our new Pharmacy School. It’s a real beaut. Does Batman have 17,000+ Robins at his side? Because every Binghamton student is my sidekick. It’s just so hard to find good tights in Pantone 342. I’d trade with the Kool-Aid Man because it’d be great to crash through walls. UberBaxter. Place your order and I’m there in 30 minutes or less to get you psyched. Work, home, the laundromat, Target. You name it. Not everyone here is from Long Island. Mic drop. 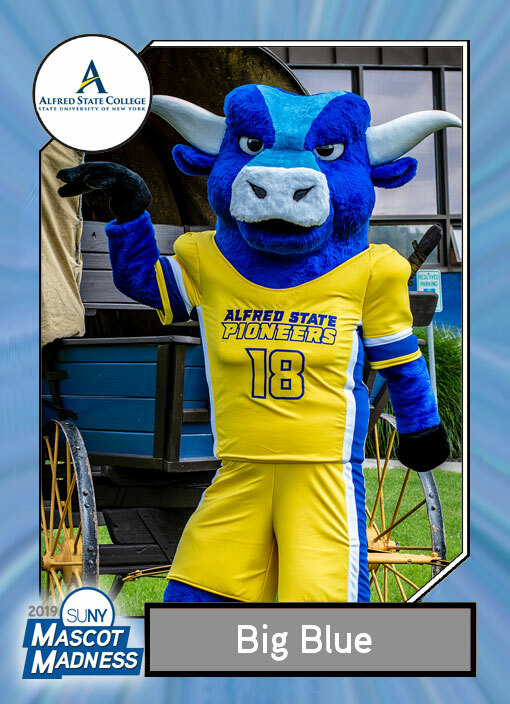 I am Big Blue, the new mascot for Alfred State. I reside in the college farm just outside of the main campus. I represent our 19 intercollegiate athletic teams and the great students and staff of Alfred State. I am an Ox but I am more comfortable walking on two feet which has allowed me to study and become a black belt kung fu master. “Rolling with Big Blue – Life Leading the Charge”. My main job has always been to pull the covered wagon on all our adventures but when I am not doing that I am leading the team into battle and leading the cheers from the sideline. When I was the mascot in waiting last year I snuck down to Texas with our wrestling team to see Ian Van Valen win the NCWA National Championship in dominating fashion. Orvis, our retired mascot. I watched how Orvis did his responsibilities and model myself after him. I still hang out around the campfire with him the night before a big games. Benny the Bull from the Chicago Bulls. I have always looked up to him and remember how he got the crowd pumped during the Michael Jordan Championship Era. I also think it would have been fun to hang out with Dennis Rodman. Started from the Bottom by Drake – the version without the curse words. Little House of the Prairie, Around the Horn, and the movie Mascots. I would make an app that creates real waffles instantly – I LOVE WAFFLES! I was a prize recruit for our football team years ago but we were never able to find a helmet large enough to allow me to participate. I was going to either study culinary arts or interior design. 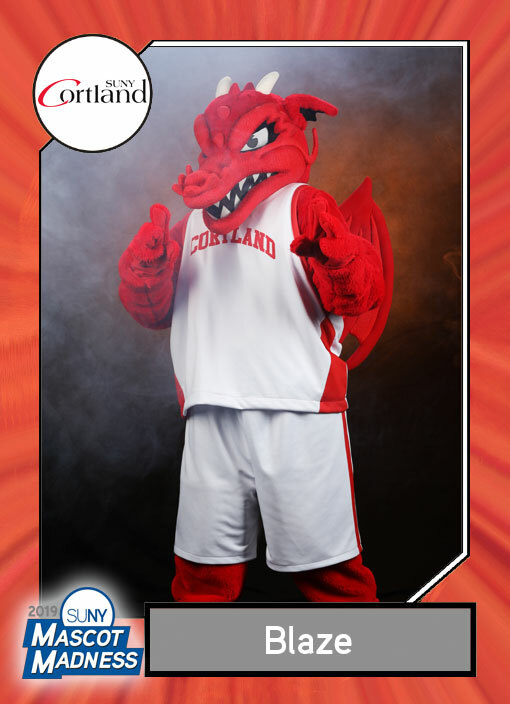 My friends call me Blaze, and I represent the best all-around college on the planet, SUNY Cortland. They call me Blaze because my real name is largely unpronounceable by my SUNY peeps. See, my branch of the dragon family tree has its roots in the Celtic kingdoms of Wales. (My hatch name is Y Ddraig Goch if you want to give it a try) In fact, you may have noticed that one of my ancestors posed for the traditional Welsh flag — carried into battle by King Arthur, and still flown today! Seriously? Do you have any idea what happened to the last person who called me wacky? I am a fire-breathing, castle-destroying, population-threatening legendary beast of unimagined power. Nobody calls me wacky. I am enchantingly eccentric. But OK, if you MUST have an answer, people are usually surprised to learn that my shorts are grafted onto my body. “Angela’s Ashes.” Angie was the first person to stand too close to me when I sneezed. That’s a tough one. Nearly everything that happens at SUNY Cortland is an epic victory/triumph. Without question, that would be President Erik J. Bitterbaum. He’s been great. We’re usually at all the same campus events, and he frequently fills in for me when I’m busy doing important dragon stuff. 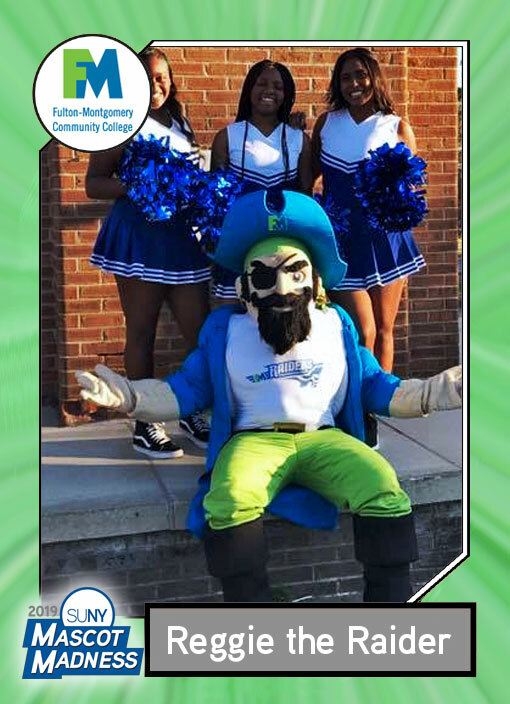 He loves engaging with students, alumni, faculty, staff and community members, and gives them his full attention. He’s smart, compassionate and level-headed. Which is good, because I tend to get mad and incinerate people. That salamander dude from Oneonta. To show them how Red Dragon is DONE. “Dragon Age” by Lindsey Stirling. Did you know that Lindsey performed at SUNY Cortland in 2012? The crowd was so big that the College had to stop admitting people into the venue. So, what did this avant-garde violinist/dancer/YouTube star/dragon-lover do? She performed an unplanned SECOND show THAT SAME NIGHT so she wouldn’t disappoint her fans! Now THAT’s Red Dragon Strong! Um, duh, “Game of Thrones.” Three of my cousins are on it. You know them as the dreaded Drogon, Rhaegal and Viserion. But to me, they’re just Danny, Rachael and Vinny. We used to sneak away together during family reunions and devour herds of sheep. Once, Vinny got caught with burnt wool hanging from his teeth. He told his parents he’d just been flossing! And they believed him! Can you believe it! Hahaha … good times, good times. My cousins. Always causing trouble, the scamps! Match.com. No, it’s not that lame dating app. Dragons think more literally. With my app, you just strike the icon and flames shoot from your phone. 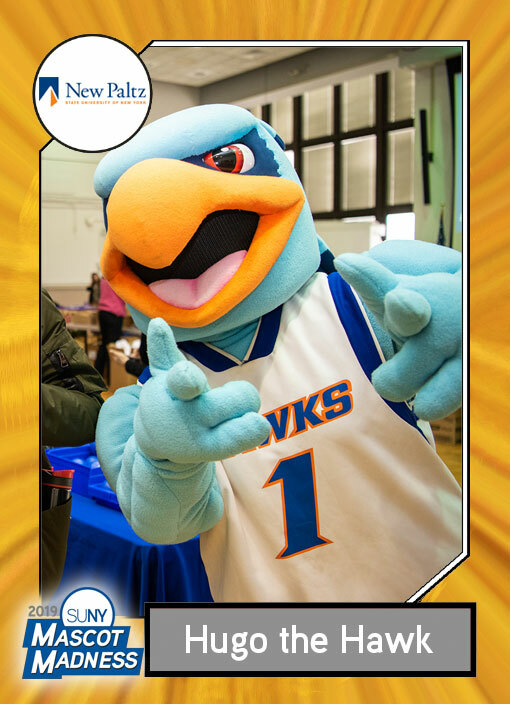 I am Hugo the Hawk and I hail from the Shawangunk Mountains in the Hudson Valley. From a young age I always wanted to help people. I was tired of constantly flying over people and looking down on them. I always thought to myself “I want to make everyone fly.” I knew that human beings cannot fly on their own, but I wanted to make them fly somehow. I flew over to SUNY New Paltz and made that campus my nest. 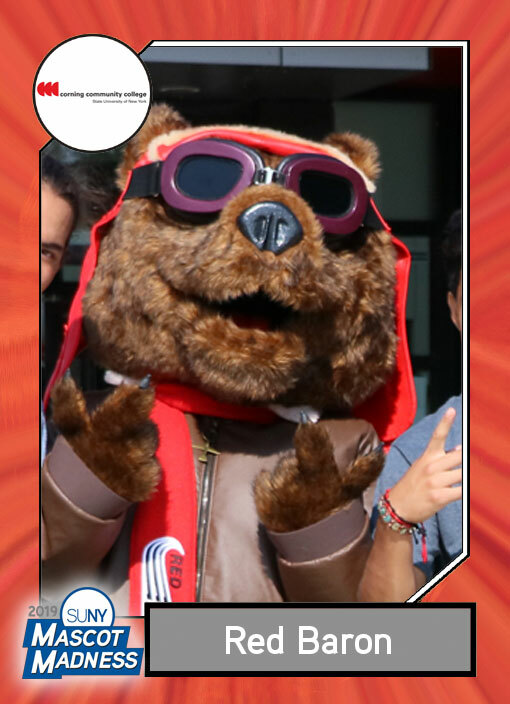 Now I makes students, faculty, and staff “fly” through encouragement. Everyone flies in my eyes because of their hard work determination and resilience. Sure I represent many sports teams, but I also represent many student scholars and club leaders. It is through these many representations that I learned that people do not need wings to fly. My wackiest attribute is his ability to eat twenty earthworms at one time. If I had to have an autobiography it would be called “Blue Blur” because I’m simply too fast. The biggest victory that I have seen the school have is the participation in the SUNY’s Got Your Back Program in which volunteers packed comfort bags for victims of sexual assault. Our participation in the program and our acknowledgment of the issue was a victory to me. I would say that on campus of course I am batman, but my Robin would be Donald P. Christian our President. If I could trade places with another Mascot for a day it would probably be SUNY Albany’s Damien the Great Dane. If we ever make it to finals my entrance song would have to be “I will Survive” by Gloria Gaynor. My favorite series to binge watch is Daredevil because that’s where I learn all of my martial arts moves from. A good app idea that I have been thinking about for a while is something I would all “InstaWorm.” It is similar to UberEats except with this app you get different types of worms delivered to you with different toppings and sides. A fun fact about the school that I love telling people is SUNY New Paltz has been listed as one of the Top Green Colleges Nationwide! 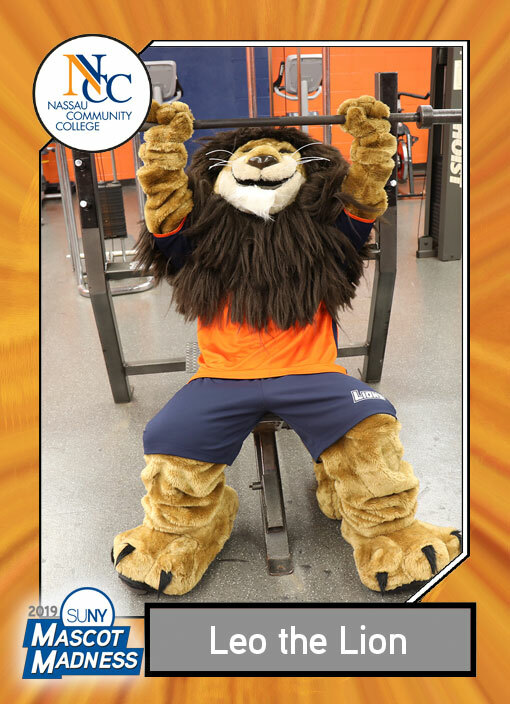 I’m Leo the Lion and I represent Nassau Community College. I’m actually a good hair stylist – all those years working on my mane. My singing is fantastic. You must have heard my roar? My pride. “My pride”. I’m very proud of them. “King of SUNY”. – for obvious reasons. “It’s a jungle out there”. Believe me: I know. The Dean of Students and I have been through a lot together: She’s the jelly to my peanut butter, the milk in my coffee. I Am Leo, Hear Me Roar: The Fight Song. Safaris and how to avoid them. 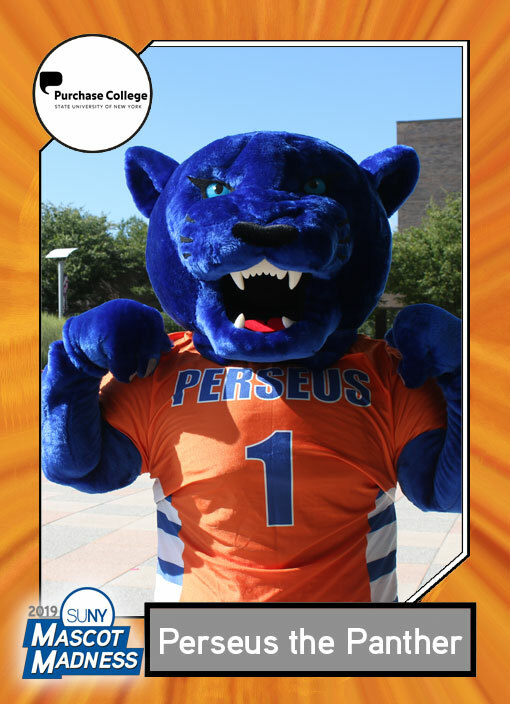 I am Perseus the Panther…born and raised in Purchase, NY…represent Purchase College and the entire Panther community, both near and far. My school pride runs so deep that I my fur is now blue. I Am Panther, Hear Me Roar. Teams winning the Skyline Championship and competing in the NAA Tournament. The students. They bring me to life! Phillie Phanatic… who wouldn’t want to be large and fury with an extendable tongue? Planet Earth I and II. An interactive game (similar to Pokemon Go) to bring more fans to the home events/games. Purchase College was the former training facility for both the NY Knicks and NYCFC. I’m the Red Baron, but most of my friends just call me Baron. I’m of the brown bear species, writing to you from the enchanting hills of Corning, N.Y., where I represent my fellow mammals from our home at SUNY Corning Community College. Even though I’m an aviator, I’m afraid of heights. Sleepless Winters, because even though I’m a bear, I don’t get to hibernate. Some of my busiest nights are during basketball season. The college received $1 million in New York State funds as part of the 2018 Regional Economic Development Council Awards to the Southern Tier. It will help us establish the Center for STEAM Innovation. The president is my co-pilot! She’s been supportive of me from the beginning. Staley Da Bear of the Chicago Bears! Rachel Ray … cause I’m always hungry. Where’s the closest shop that sells honey? Eileen Collins, the first female astronaut, is one of our grads! I am Reggie the Raider! I represent Fulton-Montgomery Community College in Johnstown, NY! My height ranges from 5’1- 6’5 on any given day. “Yes, I work out” – Duhh check out these abs. The Lady Raiders beat the number 1 nationally ranked team in Division 3 NJCAA Poll on November 4, 2018 the score was 59-53 and the game was played at Onondaga Community College. WOOHOOO…. GO RAIDERS!!!!!!! The Director of Athletics: Kevin Jones! He gives me my baths and keeps me safe. Let’s go with the Onondaga Community College Lazer. That mascot is just plain cool! That said, I am sure I could outrun him! The Sponge Bob Theme Song! Pirates of the Caribbean of course! ARRGGGHH…. Findmybooty…. Would help me find the treasure a lot quicker. I can’t tell you how much time I waste finding that X! That for a small rural community college, we have a great athletic program and always compete well within the conference. Our sports teams’ rock! 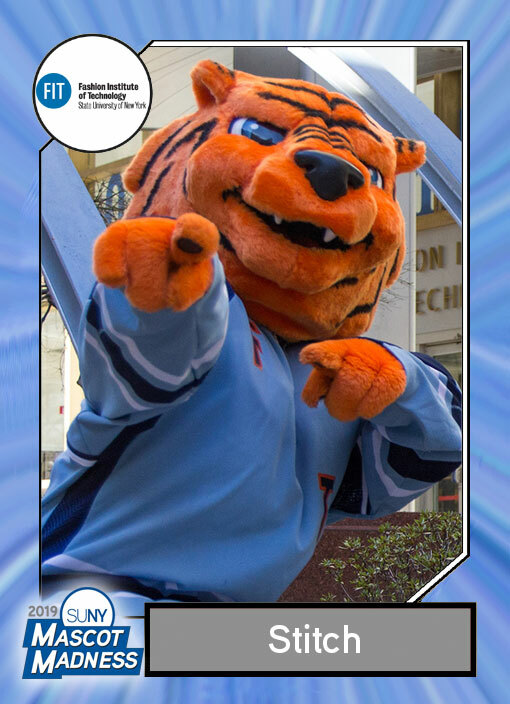 I am Stitch from FIT and I proudly represent the FIT Tigers! My autobiography would be called How to “FIT in” by Being Different. At FIT, we embrace being unconventional, and I want everyone to know that it’s grrrreat to be a unique individual and that you can “FIT in” while being true to yourself! The 2018 Women’s Swimming and Diving Non-Scholarship National Championship! 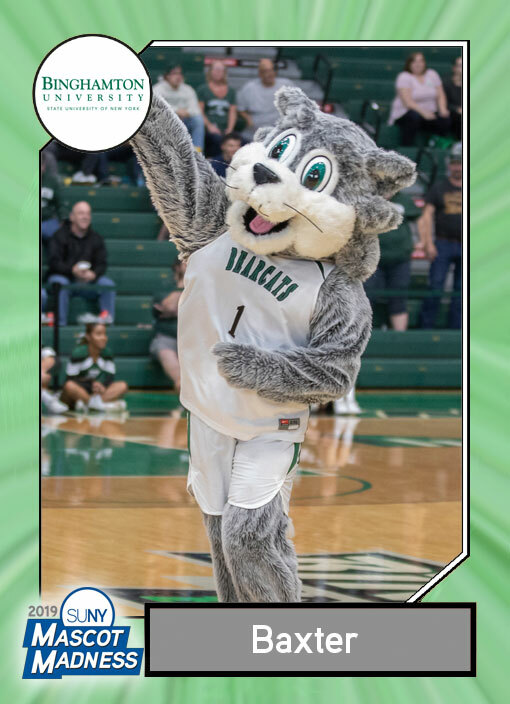 Victor E. Knight from SUNY Geneseo, so I can find out his secrets to winning SUNY Mascot Madness two out of the last three years! Survivor’s “Eye of the Tiger”! 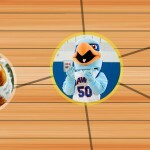 The app would be called Stitch, a social networking app that threads together the college mascot community! Michael Kors was once an FIT Tiger! I vote for Blaze! Soooo cute!